PETALING JAYA: The Malaysian Rubber Board (MRB) is mulling an exercise to develop another piece of its land in Ampang, Kuala Lumpur, and at least four developers have expressed firm interest in the project, according to industry sources. 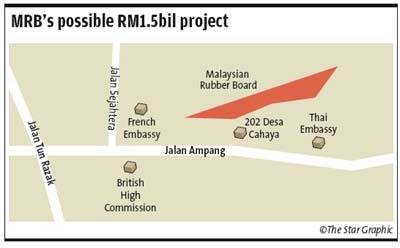 The sources added that the project would entail condominiums and office blocks with an estimated gross development value of some RM1.5bil. The land is located on Lot 211 and Lot 25 in Ampang and is situated close to the Sommerset Apartments and the Nationwide Express building. The four parties said to be interested in this project are Equine Capital Bhd, KUB Malaysia Bhd, Malaysian Resources Corp Bhd and Crest Builder Holdings Bhd. Some sources believed that Equine, a company said to be linked to Malton Bhd's Datuk Desmond Lim Siew Choon, is a front runner to bag the joint-venture deal. This comes shortly after sources had told StarBiz that MRB would be awarding a RM1.4bil development on 2.2ha in Jalan Ampang, to Crest Builder Bhd and its 49% joint-venture partner Detik Utuh Sdn Bhd. “MRB is embarking on a strategy to monetise its landbank. It is not interested in outright purchases of its land as it is looking for a longer-term business model with recurring income,” said a source. MRB's most high-profile landbank that will be tendered out soon is the development of the Rubber Research Institute Malaysia land measuring 1,215ha in Sungai Buloh, Selangor. Meanwhile, the question of ownership in Equine continues to elude investors since the resignation of its former chairman and controlling shareholder, Datuk Patrick Lim Soo Kit, in 2008. Patrick was said to have close ties with former premier Tun Abdullah Badawi. Since Patrick's exit, the media has speculated numerous times that Equine was linked to the elusive Desmond. Back in 2006, Equine was the darling stock when its 25% associate, Abad Naluri Sdn Bhd, won the mandate to redevelop the Penang Turf Club land into a RM20bil Penang Global City Centre project. This project was, however, shelved by the state government under Pakatan Rakyat following the March 2008 general election. In October 2008, Equine sold off its entire 25% stake in Abad Naluri to Kiara Ikhtisas Sdn Bhd for RM2mil. The media started speculating that Kiara Ikhtisas was linked to Desmond, who is also the major shareholder of Malton. Desmond denied having any ties with the private concern. Meanwhile, some of the high-profile projects developed by Malton include Pavilion KL and Fahrenhait 88, formerly KL Plaza. Desmond caused quite a stir on the local property scene back in 2010 when it paid an unbelievable RM7,209 per sq ft for a piece of land in Jalan Bukit Bintang. While the deal attracted lots of criticism, some also said it was possible that he was looking to integrate that parcel of land with Pavilion KL.